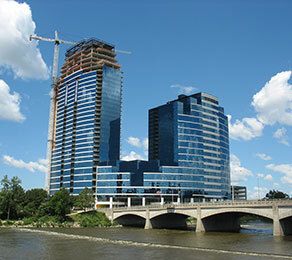 River House Condominiums is the tallest high-rise in the city of Grand Rapids, Michigan. The project created some complex and unusual challenges, which were overcome by careful collaboration between CCL and its clients. River House was not a conventional project. Because of the height of the building, the shear walls were subject to high lateral loads. Additional complexity was caused by a step in the sixth floor which introduced large transfer beams to support the 21 floors above. At the early stage of construction, the Engineer of Record, URS, approached CCL about the possibility of using vertical post-tensioning in the shear walls to increase the stiffness of the structure and reduce sway. CCL engineers worked closely with URS and the construction team to develop a four-strand bonded system that met the structural and constructability requirements set by the contractors. CCL also provided a staged post-tensioning solution to deal with the incremental loading on the structure during construction. The complexity of the solution necessitated the involvement of CCL’s experienced field service teams in the stressing and grouting of the multistrand system, ensuring this was completed to the highest level of workmanship. The girders included staged post-tensioning and were stressed in multiple phases during construction to support the increasing weight of the structure as it rose. This was a first in western Michigan, with CCL providing the design for short- and long term losses for all the staging needed to accomplish this task.